Search for all "Tyrosine-protein kinase JAK2"
Rabbit anti Human, Mouse, Rat Tyrosine-protein kinase JAK2. The antiserum was produced against A synthesized peptide derived from human JAK2. 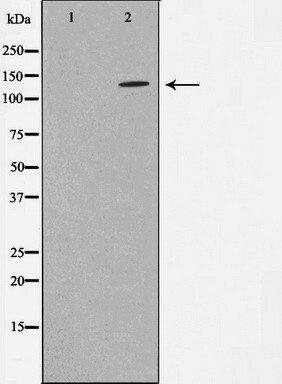 This gene product is a protein tyrosine kise involved in a specific subset of cytokine receptor sigling pathways. It has been found to be constituitively associated with the prolactin receptor and is required for responses to gamma interferon. 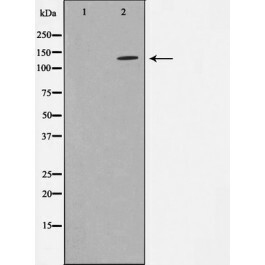 The antibody was affinity-purified from rabbit antiserum by affinity-chromatography using epitope-specific peptide. Rabbit IgG in phosphate buffered saline , pH 7.4, 150mM NaCl, 0.02% sodium azide and 50% glycerol.